I don’t know why it’s taking me so long to finish up my Paris trip. Maybe because I can linger on those days before I totally store it away in my memory for the long term. The one really strong memory I’ll have from Paris, and believe me, I already want to go back, is one night Emma and I stayed in the Hotel Foundary and watched Shakespeare in Love in its entirety. We found it on YouTube and watched one part after another in the dark hotel room. It was really great – and I can’t quite pinpoint why it was great – it had nothing to do with Paris particularly. We had one more day and we were wiped out in all possible ways. That was why we chose to hang out in the hotel instead of walking all over the place. However, there were two places we wanted and needed to see. One was the Catacombs and the other was the Montparnasse cemetery. I wouldn’t want to live in Montparnasse – I like the other side of Paris better, over by the Marais and the Pompidou. We decided to brave the Metro for the first time to get to the Catacombs and seriously, the Metro is a lot easier than you think. But you can’t bumble around like a dumbass – you have to kind of know what you’re doing. We wasted two tickets going to the wrong side but figured out our mistake the hard way. Once you get it you get it and it isn’t that bad, but god help you if you try to talk to any of the metro workers. The thing about people in Europe in general – they don’t care about you. But it’s especially true in France. They don’t care if you’re having a problem – it is not their problem. That aspect of European travel ALWAYS makes me feel better to be American. I tried to explain one problem I was having to one of the women working behind the glass but she brushed me off with a wave of her hand and a disgusted nod. I really wanted to leave Paris. I thought I had mistakenly purchased a book of Metro tickets instead of one ticket – turns out I hadn’t but I thought I had. I guess I’m just used to American customer service where they give a damn because it makes a difference to their business. In France, health care is taken care of, wage is decent enough – there is no real competition so why bother? 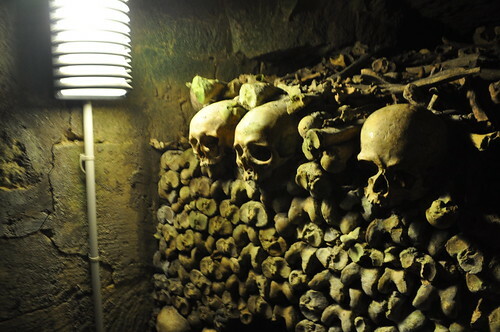 Eventually, after a few transfers we found ourselves in Montparnasse proper and we headed to the Catacombs. The line was too long but we waited anyway. We wanted our last day in Paris to be easy-ish with just one or two things to see. This seemed like the perfect thing to do. We had a couple of loudmouthed Americans behind us talking as if they were the only people who existed. And I suddenly could relate to the Parisiennes hatred of us. While we waited in line I went and got us a hot dog – one of those great Paris hot dogs with the hot mustard. Oh, those are almost worth the trip back for. 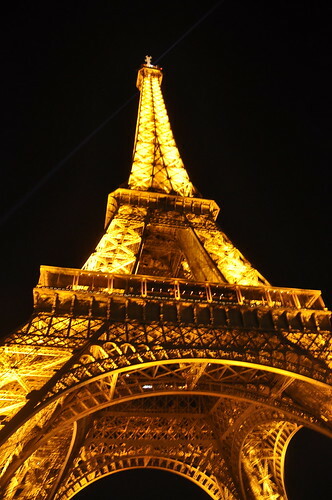 Although there are so many things in Paris that call my name, even now. Once inside the Catacombs you walk down an endless spiral staircase – down and down and down and down. It gets darker and colder and damper. You’re kind of grateful for the crowd because you know if your heart stops suddenly there are people to help you out. You walk a bit before you get to the bones and then it’s just wall upon wall of skulls and bones. It definitely puts one’s existence into perspective the way cemetery’s don’t; this isn’t about honoring an individual life – this is about how many people have come before, lived, had their little dramas and heartbreaks, minor successes, diseases and whatnot, and then died and became bones in a pile. I couldn’t get out of there fast enough, although it had one upside: it was the only place in Paris so far that did not smell like piss. Upon our exit, we decided to get a good street crepe, as opposed to the touristy kind. We found one at a small booth in Montparnasse – I got the orange and honey and Emma got the Nutella and banana (that is the one to get). They were delicious, even if they did drip all over us. Afterwards, we wandered down to the cemetery, but to be perfectly honest, our feet could not take anymore walking. That was that for us. 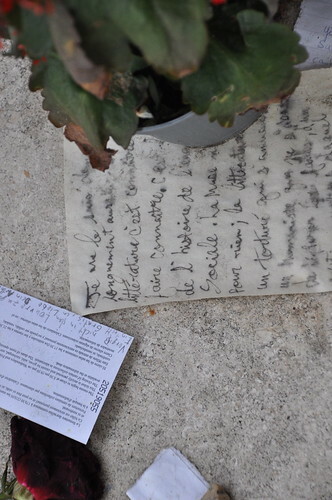 We hobbled over to Jean Paul Sartre’s grave, snapped a photo and then called it a day. We got up very early, like 4am, in order to take our metro to the airport. We opted out of the Bee Shuttle because it had been so expensive the ride in. It was trippy but doable, lugging our suitcases down the cool streets of Paris, sans coffee, down the stairs and occasionally up the stairs. A nice gentleman helped us up one flight of stairs. There are kind people everywhere, you just have to be lucky enough to bump into one. We finally got to the airport but we knew Emma’s passport had been lost there and was in the Lost and Found somewhere. We were told that it didn’t open until after 9am and our flight was to leave around 10am. Emma burst into tears after Security managed to get the Lost and Found opened but alas, no passport. Eventually we just went to our airline and they had her passport all along. We boarded our plane and without incident, as in “international incident” we were flying out of Paris. Paris is the place of our sweetest dreams, even still. The longer the time between from then and now, the more we mature and grow, our memories filter out the stuff that made the beautiful city agonizing. And all that remains is that unending beauty. Paris captured my heart. I know I will be back there sooner rather than later. And I don’t even care that Paris doesn’t love me back. It’s an unrequited love and that isn’t the worst thing in the world. The next thing to happen would be three connecting flights on our way back to LA – Paris to Milan, Milan to London, London to Los Angeles.